It starts by setting the clocks forward an hour and noticing the daylight hanging around a little later everyday. The windows creep open a little more each day, and without warning, the sound of lawnmowers fills the neighborhood. And as we trudge sunburned into work after that long and glorious Memorial Day weekend, the realization hits.. If there’s one thing that 4×4 enthusiasts love, it’s being outside. And if there’s any vehicle perfectly suited for being outside in the summer, it’s a Jeep. Summertime means taking the top off and cruising the long days in the sun. For the rest of us, the sight of a doorless Jeep cruising the beach with a surfboard strapped to the bars is nothing short of an American summertime icon. Jeeps were originally created for adventure. Three generations from the first CJ (Civilian Jeep) production in 1945, Jeep has reliably maintained core elements like the stocky wheelbase, solid front axles, and the trademark roll bars, all of which stylishly and subtly highlight their tough military ancestry. Today, these designs enable Jeep enthusiasts to roam through rugged terrain in an open-air cab that serves form as well as function and safety. In case you haven’t heard, baseball season is now in full swing, and Memorial Day is right around the corner. It won’t be long before it’s time to hit the beach, the trails, or the highway. For Jeep owners, summer means more recreational driving in more extreme temperatures. Getting your Jeep 4×4 ready for summer requires maintenance. Here’s how you can be prepared. Taking pride in your ride means an emphasis on detailing. Dirt, scratches, chemical residue, and environmental material accumulates in the topcoat throughout the year, and a thorough detailing can remove these and expose the immaculate paint beneath. A simple wash/clay bar/polish can clear many contaminants from the top layer of paint and make a noticeable improvement. For a more significant correction, consider upgrading to a more durable exterior with a high-pressure sprayed bed liner. Not only will it eliminate past damage, but it will also provide future durability against brush, rocks, hail, etc., and even more importantly, it will make your Jeep stand out. Summer is hot, especially in Texas. Summertime means more recreational driving, so inspecting a couple of simple common-wear items can be critical before road or trail trips. Check coolant levels – low coolant means a leak. Monitor engine temperature – a reading that’s very high or very low, or variable, means there’s a problem. Check your fan for a wobble – a slipping fan clutch isn’t easy to notice if you frequently take short trips. Get out the grease – Zerk fittings, ball joints, u-joints, driveshaft slip joints, control arm bushings, and leaf springs if necessary. Check tires – Tire pressure, thread, sidewalls and check for even tire wear to identify any suspension issues. Stand out this year. Lifting the Jeep looks rad and increases ground clearance significantly. Additionally, lifting provides extra space for larger wheels and tires. If you’ve been dreaming about 37’s on paint-matched custom wheels, now is the best time. Nothing improves a ride like great music. Bump up your speaker game this summer a custom Wet Sounds audio system. Or add a couple of custom 550 Grab Handles for some extra stability. One simple way to make any riding experience more comfortable is having a secure space for your stuff. Improve cargo capacity to your Jeep by adding a roof-mounted cargo basket, Baja basket, or cargo rack. Summer will be here before you know it, so now is the best time to get your Jeep ready to ride. 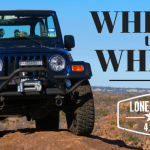 Find out how else Lone Star 4×4 can help your Jeep summer ready this year.